The new Meryl Streep-Julia Roberts movie August: Osage County was filmed on location at this 100-year old farmhouse in Pawhuska, Oklahoma. It’s standing empty and looking a little forlorn now, but I think the bones of it are beautiful (and a little haunting). I love the big porch. It, like everything else, needs a lot of work, though. The wallpaper looks original, too. But I’m wondering how much was added for the movie to give it that “old farmhouse look”? Set designers can do amazing things to transform spaces. Both Meryl Streep and Julia Roberts nabbed Oscar noms for this movie. I’m a Benedict Cumberbatch (and Sherlock) fan, so I was excited to hear he was in this movie, even though it’s a small role. It was built in 1916 and sits on 22 acres. The kitchen looks huge in these photos. What would you do with it? The movie was filmed on location in North-Central Oklahoma, just over the Kansas border. The farmhouse was on the market last year for $250,000 but listing was removed in November. So I wonder if that’s how it looked before the film crew took over? Makes me think that maybe the (convincingly old-looking) wallpaper and mural were perhaps added by the production designers for the movie. If anyone knows more details, fill us in! The Houses in the Classic Movie "Leave Her to Heaven"
That kitchen + bath are both beauties, + I’d change very little. Meanwhile, I’ve not yet seen the movie but did read the play a few years back. Coincidentally, I just discovered that it IS playing out here in the middle of nowhere, so I s’poze we/I should spring for a matinee before the Oscars! I saw it and actually leaned over to my husband during the movie and said “I’d be depressed, too, if that wallpaper was hanging in my house.” 🙂 I agree with Beth about having the hostile family dinner. Same experience. Good grief that kitchen is huge! The wood in the cabinets looks pretty, but I know I would probably end up painting them (can’t help myself) and I’d replace that floor with wood. The house has great bones (and a lot of porch space!) I do not plan on seeing it after hearing all the reviews of it. I went to see Saving Mr. Banks without reading reviews thinking it was going to be a comedy. It is not. It was very sad to me, but I did love Tom Hanks in it. So I will use my movie money for dinner out instead. Thanks for a movie Monday, Julia! I didn’t know Saving Mr. Banks was a sad movie. I thought it would be more lighthearted than that. I’m glad to know that before I see it! Well isn’t this an old beauty!? The wall coverings are a bit scary, but otherwise I don’t think much needs changing. I would rip out the linoleum in the kitchen and put down wood. I haven’t seen this movie, but it does feature several of my favorite actors, so I’ll check it out for sure. I think that, although movies like this can be depressing, they’re good for the slice of life factor. Perhaps people don’t feel like they have such crazy family issues when they see movies like this. Good point! Just think how much better we’ll feel about our own families after a movie like this. Ha. I haven’t seen the movie yet because I thought it sounded too depressing. My good friend did see it and she said it wasn’t so depressing to her but made her appreciate her family after seeing how dysfunctional this one was. There are some movies I will watch just to see the houses in them – this may be one of them. Thanks, Julia! Great find Julia! I have not seen the movie yet either but it was the house on the plains that intrigued me from the previews! I am so very happy to learn it is actually a REAL house! Yeah, that’s actually a rare thing in the movies these days! The exteriors are often real but the interiors are usually sets on a soundstage. It’s fun to see how they used a real farmhouse for this one. I really enjoyed this movie. A lot of people around me were grumbling about it when I was walking out. I agree with the above comment you leave feeling really thankful for your own family. So with that I am so excited to see this post! 🙂 I’m even more interested in this house now! I hope someone knows more information about it. Doesn’t Pioneer Woman live in Pawhuska? Maybe she’ll go check it out for us..I for one like the house very much..I do like the mural, but the wallpaper needs to go. Love all the big rooms and wouldn’t mind a shot at that big old kitchen.. I was just going to ask this same question! I do believe Ree Drummond from The Pioneer woman.com lives outside of Pawhuska, OK. Might have to dig thru her archives but I swear I have seen this house somewhere before on a website, might have been her website? 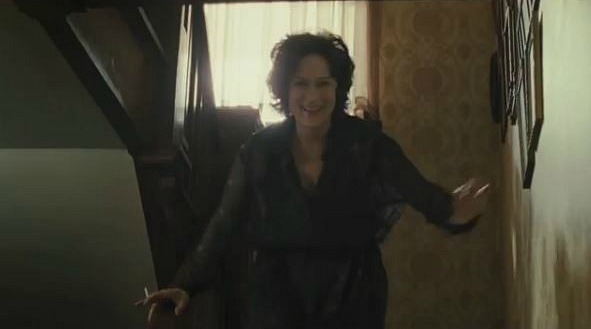 I was very curious about this house, so I looked around and found this news story from a local TV station: https://www.newson6.com/story/23785095/inside-the-osage-county-house-that-stars-in-august-osage-county. According to the story, the house was a Sears catalog house, the mural is actually a digital photograph that was enlarged and pasted onto the wall and the production company dug up and moved several trees that were probably a hundred years old. Interesting stuff. I hadn’t seen that! Thanks, Margaret!! Great house, terrific play, bad movie. How anyone thought Streep and Roberts worth of Oscar-caliber performances is beyond me. Maybe it was a slow news year. In the meantime, wonder why they took the old beauty off the market? That house feels creepy to me. Maybe it was pretty before the family moved out and in the springtime surrounded by green. But now all it conjure is mental illness. I just saw this movie last night. The previews made it look funny, a little dark. What it was was VERY dark, and not funny. It was well done and everything, but the older I get the less grim and unpleasant stuff I want to watch. As for the house, I love it. It has so much character, and the movie people have added more. Love the mural, and the wallpaper. Not the location so much. Ha…I’m with you. I have my husband watch movies, etc. and then if it has a happy ending I’ll watch it – otherwise, forget it! We rarely go to the movies anymore, either. If we do, we usually want something fun or funny. For one thing, I hate crying in movie theaters! Ha. Thanks, Judi! Nice of you to post a little eye candy in the form of Benedict Cumberbatch, Julia! I dare say you may have as many Cumberbeauties on here as Hooked on Houses fans. All joking aside, I love the house, except for the wallpaper, and one beautiful bathroom. I’m sure there would be enough room downstairs for another full bath to be added. Can’t wait to see the movie. Thanks for your lovely posts, you have excellent taste…after all, you are a fellow BC fan! Interesting house. Love how you were able to get shots of the movie and match them up. If you go to the Zillow listing, it has an island of sorts in the kitchen. It also looks better too. I wonder if they either are staging it or someone is renting it now. The wood in it looks like it wouldn’t take much work to restore. The wallpaper on the other hand, lots of stripping! Too dark. Thanks for finding this listing. The odd thing is that those appear to be older photos from when it was on the market before (before the movie was made). Looks to me like the production designers stripped some things out of it, like that kitchen island and maybe the sink in the hallway by the stairs. They clearly did a lot of work to make the house look older and in worse shape than it was to begin with! Thanks, Rebecca. i just can’t get past a period home in the middle of oklahoma being listed as a victorian tidewater home :)! it could be a great house, with a whole lotta love. Good point about the “Tidewater” description, Nanne. Ha. One bathroom? Yikes! That is not going to work. If you have 5 bedrooms then obviously you have a big crew and need more than one bathroom. Hopefully you could get two if you were spending that much. That said though, it is such a lovely farmhouse. I don’t mind the wallpaper since it seems to go with the theme of the house. I totally agree with your friend’s movie review! The house was the best part of those characters. I have never seen such a well-acted horrible movie. I totally agree with you! The house was the best part in that awful movie. Thanks so much for sharing the house pics and the movie reviews! Thanks to Beth’s input, I think I’ll skip spending money at the theatre. But the house is pretty fantastic! Wish it was closer, so I could work on it! What a great place just brimming with potential. 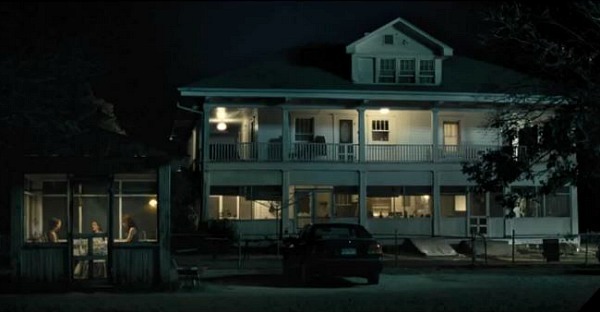 Loved the porch in this movie. That’s about all I loved though. I don’t think I’ve ever seen a film where there wasn’t one single likable character! Oh, wow. There were a lot of characters in this movie, too, so that’s saying something! Maybe the reason there was so much meanness and anger in the movie is because there’s only the one bathroom for all of those people. If they’d addressed that in the movie, I might have been more sympathetic. I think you might be onto something, Beth! Ha. One of my favorite movies…loved the house, loved the music. First time I was aware of Glenn Close. Wonderful views….had to visit Beaufort! The house is so beautiful. I just loved everything about the house. Thanks for sharing…..
My husband and I saw this film a few weeks ago. For those of you who haven’t, maybe I can help. Close your eyes and picture the Waltons, in their sweet unpretentious farmhouse, three or four generations living together in peaceful harmony. Now picture The Exorcist, Nightmare on Elm Street, and The Silence of the Lambs. Mix ’em all up. BAM! I just saved you 12 bucks. You’re welcome. You should write movie reviews, Maureen. That made me laugh out loud! As someone from Oklahoma I have been wanting to go see this film, but when I’ve seen the previews I cringe at their generic southern accents. They don’t sound like Okies at all. Wish they would have done a bit of research. As for the house,wish someone would make it grand again. I thought the movie was great and the acting by everyone was fantastic. I’ve heard from several other people who loved it, too. Interesting how everyone reacted so differently to the movie! The acting WAS great. The STORY was awful. Great movie with superb acting stars.. And yes the house was huge .. beautiful outside view of plains. Loved the movie, saw it twice. The house is great and would look so good with some TLC. Just saw the movie after seeing these photos. Don’t listen to the nay-sayers! It was great. Yes, it was dark, but I didn’t find it depressing. My sister recommended that I see it, and said the acting was just wonderful. It was! My friend and I saw it together, and we both really enjoyed it. It WAS kind of funny in parts, in a dark way. Having seen the photos of the house on this site made it extra interesting to watch. Go see it! I hardly ever leave a movie not knowing exactly how I feel about it, in that I either love, like or hate it. Movies, like houses, to each his/her own! It is so interesting to hear all the different reports from people who saw the movie. Thanks, Destiny! Ok. I did see the movie and loved it (My husband and I go to the movies on a regular basis). Don’t watch it if you are looking for a feel-good movie. Julia Roberts and Meryl Streep gave fantastic performances. The scenery was perfect and match the mood of the movie, as did the music. It definitely left an impression on me – I can understand why it was nominated for so many awards. The house definitely added to the story. 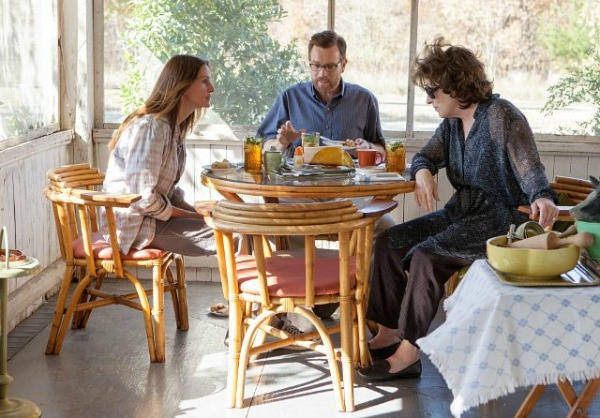 I’ve been a follower of Hooked on Houses on FB, but actually came across this post because I was Googling “House from August: Osage County” because I love the dining room as well as the porch on the second story. I loved the mural in the dining room so much that it was actually a distraction. In my defense, the mural looks very different on film than it does in the photos above. Loved the movie. Loved the house. I loved that mural, too. I thought it was original to the house at first and was surprised to learn it was created for the movie. The set designers did an amazing job of making the rooms feel like they had a sense of history and age to them. Thanks, Jen! I said all of that to say this: She is *incredible* in this film. I’m not saying she deserved the Oscar over Lupita (I haven’t seen 12 Years a Slave), but she certainly earned the nomination. Meryl, too. 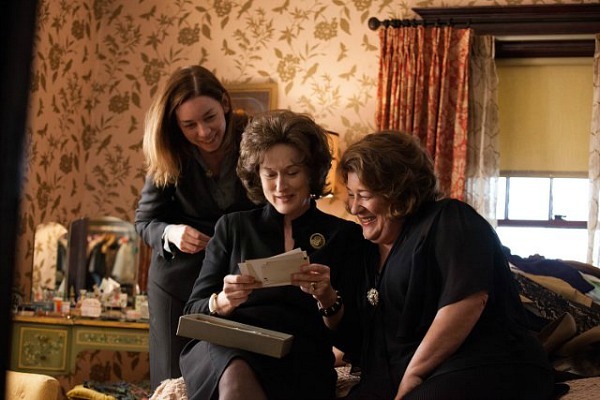 I’m kind of surprised that Margo Martindale (Aunt Mattie Fay) wasn’t acknowledged for her performance, which was also strong, though minor compared to the two powerhouses. Anyway… I appreciate the movie. I can’t say I loved it or would even watch it again (and I am a serial re-watcher, let me tell ya! ), but it was brilliantly done. The house is the perfect setting for the film, too. It was soooo dark and depressing, the house was like another character, perfectly cast. I looked at buying that house in the mid 90s. Was totally shocked to see it in the movie. The one main improvement is that the green shag carpet is removed through out the bottomfloor. It has a full brick basement and the attic is still unfinished on the movie. Beautiful location next to a wildlife preserve. It was priced for 85,000 back then. It is what they called an Indian Head Rights home. It has historical value to the Osage nation. I rented this movie thinking it was going to be a comedy along the lines of “Little Miss Sunshine.” Boy, was I wrong! It was one of the most depressing movies I’ve ever seen. Meryl Streep is my favorite actress, and I agree: she was excellent. It was quite a house, though, I must say! I was in Pawhuska last month by happenstance…in search of bison. We found them at the Tallgrass Prairie Preserve, and it was a wonderful experience. I have followed Ree Drummond (the Pioneer Woman) in blogland and on Instagram. I didn’t discover, until later, however, that the Drummond ranch is near there! 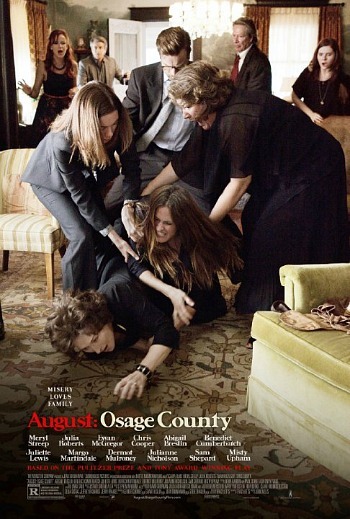 I watched August: Osage County, probably before I ever knew I would be visiting Oklahoma. Normally this would be my kind of movie (a family drama filmed on location) and how can you go wrong with Meryl? I didn’t like it at all. Not a wonderful experience.